Click the button below to add the 14 inch diameter two-sided electroplated diamond grinding disc to your wish list. 14 inch diameter machined electroplated steel diamond grinding discs that attaches to a potters wheel like a bat. 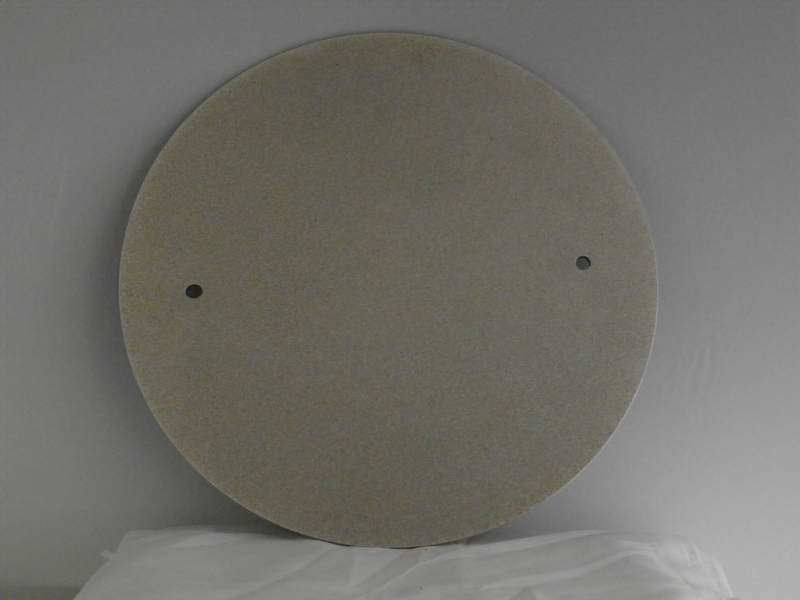 Both sides of the thin discs have a diamond grinding surface, one medium/coarse (120 grit), and the other fine (400 grit). Just flip the disc over to change grits. Both sides are separately replaceable. Use with water. 300+ square inches of total grinding area, two 14" discs back to back, combined as one. Use only the included special low head bat pins 1" in length, to attach the grinding disc. If your wheel requires 1 1/2 " bat pins, e-mail or phone and I'll send those instead. Regular bat pins will stick up above the surface. There is an additional option of a 12" X 1/8" plastic bat that raises the height of our discs if you prefer to use your existing bat pins. I just received my new diamond grinding disc and it looks great! I had been using a sticky backed carbide sandpaper like disposable disc to smooth the bottoms of my pottery but felt like there should be something better so did a little searching. Just gave it a shot on some mugs and i believe this could be one of my newest best friends! Hoping it will last a long time! Great service on delivery too!